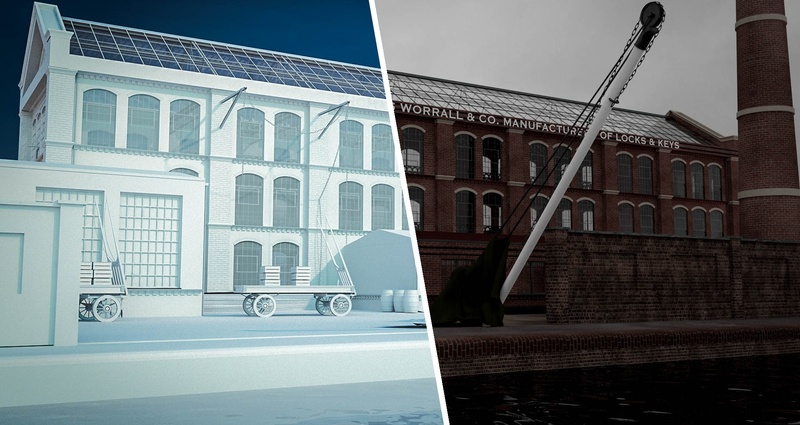 When I was still learning to 3D model to any kind of standard (a few years ago now), I designed and built a large Mid-Victorian factory for practice. It remains my proudest piece of work to this day; so much so I gave it a full video animation, which may be viewed here. The aim with this project was to get a feel for modelling larger architectural environments but without the confines of using a specific historical structure for design. As such, I progressed with creating my own from a mixture of memory and real engineering principles of the period; to this end I also set myself a strict subject, period and location (Major Lockworks, 1871, Birmingham). The central roof is my pride and joy on this project as it was done almost completely by memory and just proves how powerful 3D is as a medium for recreating technical history. It also happens to look surprisingly realistic in black and white! I wish I could say it is a complex and well informed set of events which led me to follow the design I finally went with, but really that would be a bare-faced lie. I knew I wanted a long, bright, red brick and terracotta central building finished in the Victorian Classicist fashion, flanked by smaller ‘child’ structures. I had a very strong idea of what i wanted right from conception. It was important to me that I found the building attractive, to make it easier to maintain solid creative direction. The finished project can be found here in its entirety. Let’s just rewind though. Something occurred between planning and presentation; the modelling process! Stage 1: Developing ‘filling’ walls for the main structure. Stage 2: Confirming dimensions and major bodies. Stage 3: Adding basic structural detailing including base skeletal elements from external skeletal model. Stage 4: Completing structural detailing including brickwork finery and roofing. Stage 5: Adding window detailing. Stage 6: Internal filler walls, doors and brickwork sign-writing. Stage 7: Finer details for main complex, texturing initiation, windows and roofing for auxiliary buildings. Stage 8: Main factory complex completely finished; depot block detailed and textured. Props and detailing added (drey wheel, hoisting beams etc). Stage 9: Creating alternative lighting & environment. Stage 10: Landscaping and earth development. Stage 11: Landscape detailing, background additions and canal (off-screen left). Stage 12: Final polish, texturing and rendering. Stage 1: Space plotting and deciding on a basic design. Stage 2: Expanded internal wall. Toyed with the idea of creating furnishings and a stained-glass ‘skylight’ for natural lighting, but couldn’t make it look convincing enough so scrapped the idea. Stage 3: Joinery, gas lamps and wall texturing took no time at all once I’d gotten the hang of it! Gas lamps were created using Subdivision and tinted ‘glass’. Stage 5: Experimenting with external gas lantern lighting. Stage 6: Experimenting with internal & external gas lantern lighting. Following this learning curve, it was at this point I realised something was fundamentally wrong with my design. In my quest for light, I’d given too little thought to space on the actual factory floors! Once completed, I took a critical step back and took a good look at the finished design. The building was just as elegant and aesthetically pleasing as expected, though most certainly lacked an effective ‘purpose’. I designed it with rows of steam-driven lathes and powered tools in mind (I even toyed with the idea of building a steam engine but decided against it due to time restraints so ultimately only modelled the drive shafts). Indeed, the very reason I designed it with a glass roof and mezzanines was because of its lock-working designation making a need for good lighting conditions during the day. Upon conclusion, however, I realise it became much more a study of industrial atmospherics; creating the *feel* and *scale* of being inside a newly build Victorian factory such as this attempts to represent. To this end, I feel I succeeded in creating a purpose for this project and left it satisfied I had also expanded my modelling expertise. All 3D Art is (C) R & H Visualisation.